The Alchemist Gastropub is leading the way in the hospitality scene here in Warsaw. How? By creating a new, interactive drinking & dining experience that combines technology and gastronomy, which also empowers the ladies! Women like beer too! But having to queue in a multi-tap packed full of dudes to buy a beer is far from ideal for most. The Alchemist has created Central Europe’s first and only Self Service Wall of Craft Beer. Customers can top up a card at the bar with credit, pay-pass style, then are free to pour from the wall of 8 taps. All taste profiles, flavor descriptions, alcohol content are displayed on modern iPads above each easy to use tap, and you can pour yourselves tasters before committing to a full pint. In an ingenious way they have eliminated the need to queue, removed the pressure felt by some at the bar when asking the bartender lots of questions or for a taster, whilst still allowing the drinker to have a great interactive craft beer experience. Female users are loving the freedom of the experience, in-fact more so than the guys! The Alchemist presents their beers simply on the wall from stronger beers on taps 1 to 5 and progress down the line to much lighter and more floral IPAs & imported English Cider to on taps number 6 & 7. Then at the end of the line is tap No.8 which is the pour your own Imported Italian DOC Prosecco, which is in itself a technological first, and extremely popular with the ladies of Warsaw. English Executive Chef Edward Shellard apparently knows exactly what the Warsaw market wants too. His modern International Gastropub cuisine caters to the pallets of all the customers perfectly and pairs with the carefully selected beers on tap. The attention to detail and the sheer variety of his menu is stunning. The offering ranges from premium seafood dishes such as Octopus Carpaccio and black tagliatelle pasta with king prawns, to a lighter, low calorie pizza Bianca with English cheddar cheese, apples, chutney and salad, all the way to possibly the juiciest and best value Entrecote steak in town served with Argentinian Chimichuri sauce! His menu clearly presents allergies symbols, with suggestions of “Protein Pump” dishes and lower calorie dishes for the customers who are watching their health closely. The Front of House team are also charming and highly educated to pay attention to dietary requirements and customers’ requests. The whole experience is incredibly forward thinking and empowering and everyone simply loves it. Ladies! The time is here! The time is now! 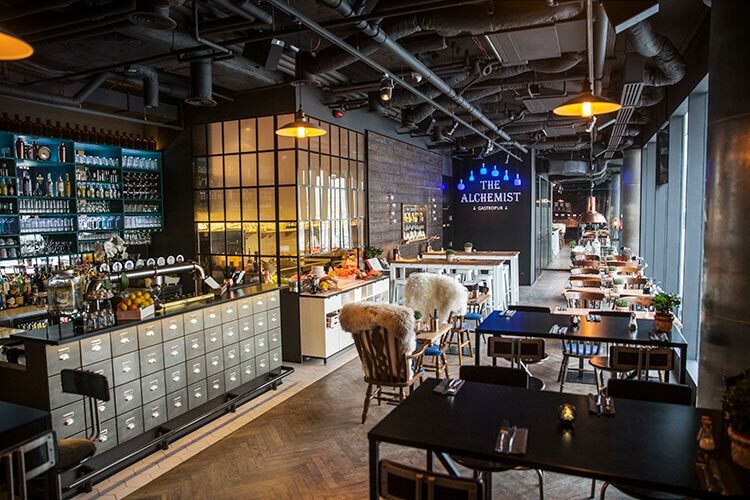 The Alchemist Gastropub in Warsaw is leading the way, and it is the first and only self-service craft beer experience in Central and Eastern Europe! Newsflash! Women like beer! Since when has drinking a beer been an anomaly for women? Or standing in a queue waiting for any drink? I agree the Alchemist is fantastic, and I love the wall of beer, but, it’s enjoyable for all genders, not just women. Although I guess it allows us women to reminisce about our days as barmaids. Just this time we are serving ourselves rather than all those rowdy men. Forward-thinking indeed!